The People’s Action Party government aims to make Singapore an innovative economy but discourages oppositions in opinions, thinking and behaviors. Can an innovative economy be done without oppositions? Assuming PAP is adopting Confucianism and Legalism practices in designing Singapore model, can it succeed by only concentrating on Red Ocean Strategy? No. In the knowledge economy and post-industrial era, PAP needs to have Blue Ocean Strategy. Singapore model is long over due and urgently needs to be refined and reformed with inputs from Daoism. Otherwise, it is back to square one, Red Ocean Strategy. And it will not generate productivity, creativity, innovation and design that Singapore economy requires in the decades to come. The Economic Strategies Committee wants Singapore to be an innovative economy and its recommendations look more like the so-called old bottle with new wines. HIGH-SKILLED PEOPLE, INNOVATIVE ECONOMY, DISTINCTIVE GLOBAL CITY. We must make skills, innovation ad productivity the basis for sustaining Singapore’s economic growth. This will also provide for inclusive growth, with a board-base increase in the incomes of our citizens. We must also be a vibrant and distinctive global city – open and diverse, the best place to grow and reach out to a rising Asia, and a home that provides an outstanding quality of life for our people. Hence, the Economic Strategies Committee report and Budget 2011 are repeating the same policies to promote and create awareness on innovation, creativity and productivity. The government even goes ahead to set up a design university, Singapore University of Technology and Design. However, all these are hard ways and infrastructure, like Legalism and Confucianism practices. In order to breakthrough in creative industry and other high value industry, you need to implant the seeds of negative thinking, opposing opinions, different views, in our education and business. Daoism can help to motivate and stimulate this creative mind. HIGH-SKILLED PEOPLE are not only working smart but thinking smart. INNOVATIVE ECONOMY is not building infrastructure but promoting different and alternative ideas. DISTINCTIVE GLOBAL CITY is not importing foreign talents but nurturing own talents. The appreciation and understanding of (philosophical) Daoism is lacking or at a very lower level in Singapore. It is understandable as we are not even having a good understanding of Confucianism and so how to talk about Daoism, which is more difficult and complicated in terms of intellectual and creative thinking. As a population, we don’t even have enough competent Chinese intellectuals to communicate with the Chinese. This is proved by the introduction of the new PAP candidates in the coming election who are not well equip with Chinese knowledge. DPM Wong Kan Seng admitted in the press conference. To implement or apply Daoism practices, you must accept oppositions. Otherwise, it will not bear any result. Why, because Daoism means alternative thinking, opposite views, and against the practices of Confucianism and Legalism (Singapore success model is based on Legalism and perhaps little bit of Confucianism). But the world is changing and everyone is looking for Chinese market. In China, the Chinese, with the more than 2000 years of history, is not only learning Confucianism but Daoism and Buddhism (Zen) too. So, knowing Confucianism is not enough, not to mention our western base education system has not provided a good foundation of Confucianism to students. 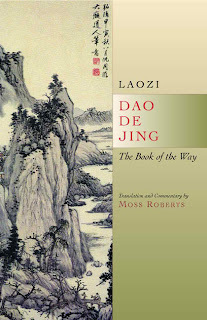 Dao De Jing (The book of the Way) also called Laozi is a book by Laozi, the founder of Daoism. Dao De Jing is the masterpiece for both philosophical and religion Daoism. Innovation, creativity, and design are making or doing some things out of nothing, i.e. emptiness. This is one of the important contributions that Daoism can bring to Singapore. In Chapter 11 of Dao De Jing, it shows the application of emptiness. Put thirty spokes together to one hub, The original empty space makes the use of wheel. Knead clay into vessels, The original empty space makes the use of vessel. Shape door and windows for a house/room, The original empty space makes the use of house/room. So the things that are made are only conditions, What [we] are using is still the original empty space. Singapore planners like to use mathematics to measure the development and they like to show statistics for their achievements. Daoism does not see it this way. Laozi wants to explain things in a way that the usefulness of some things is actually supported by the non-usefulness. You build a house with 4 walls but the walls are meaningless if they cannot make room for people to stay, work or entertain. For investment, you look for the intrinsic value of your investment. Warren Buffett can see it but others cannot. You may have better computer and mathematical instruments than Warren Buffett but how come you cannot beat him in investment return. 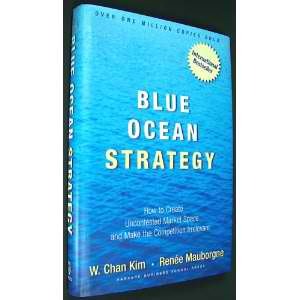 Now back to the Blue Ocean Strategy. Blue oceans, in contrast, denote all the industries not in existence today—the unknown market space, untainted by competition. In blue oceans, demand is created rather than fought over. There is ample opportunity for growth that is both profitable and rapid. In blue oceans, competition is irrelevant because the rules of the game are waiting to be set. Blue ocean is an analogy to describe the wider, deeper potential of market space that is not yet explored. Daoism is against war and against competition as nature will take its pace. Value Innovation is what Daoism is looking into. Because of opposite thinking, Laozi stresses on the application of the original empty space. This empty space should include every possible nothing. Value Innovation is also quite similar to what Bertrand Russell’s “create and share”. Create and share vs. conquer and occupy. Which is harmony? Bertrand Russell (Nobel Prize in Literature 1950), visited China in the 1920s and taught philosophy there, was a great admirer of Laozi. He believed human nature has 2 impulsions (or urges). One is occupation and the other is creation. In today’s term, occupation means you want to be no. 1, you want to expand, and you want to conquer the market. On the other hand, creation means you want to create things so that you can share with others. Daoism believes nature will create things and share with other people. It will then bring harmony (to the world). This is the requirement of today’s business management. That is how you can sell your products without occupying the market, or selling your soft knowledge without leaving your country. This is critically important to the future Singapore – the promotion of soft power in a knowledge economy. Singapore’s success model is like “conquer and occupy”, the first impulsion that Russell mentioned. When we expand our market, when we invest in Indonesia and Thailand, we always encounter difficulties perhaps also receive a bad name. When we enter Suzhou, we tried to be in command in the industrial park development. These are some examples. The reality is if you are using “conquer and occupy” tactics like in Singapore, you will get into trouble. However, at the same time, we also do not have the second impulsion or only a little of it - creating value and sharing it with the locals. (The Dao) produces (all things) and nourishes them; it produces them and does not claim them as its own; it does all, and yet does not boast of it; it presides over all, and yet does not control them. This is what is called 'The mysterious Quality' (of the Dao). Doesn’t it look more like the new business model of Google, facebook, twitter, etc. They all have the feature of “create and share”. There are other interesting references from Dao De Jing that the PAP government can learn from it. How many times has the PAP government turned the fish? In Chapter 60, Laozi advised government not to turn the fish while frying it. PAP government in fact has applied it but in a wrong way. Former US President Ronald Reagan quoted from the Daodejing in his State of the Union Address: "To govern a great nation requires the same care as to fry a small fish." SM Goh Chok Tong had once mentioned this. Not sure, he understands Laozi correctly. However, Laozi’s saying is not to turn the fish too often but has the PAP government listened to it? They keep on turning the fish by introducing changes, e.g. changes in number of MPs in the GRC, changes in electoral boundary, changes in NCMPs and NMPs scheme. These are bad examples of turning a fish and perhaps the bad examples of the application of emptiness by creating new game play to fix the Oppositions. The way of the Teachings is heavenly, It is to supplement the deprived at the expense of the excessive. The way of the people is different, It is to proffer the excessive at the expense of the deprived. Laozi warns the ruler and government. In running the country, the ruler must follow the natural development and not to add extra burdens to the people. The natural way is to use the “have” to compensate the “haven’t”. However, the human way is the opposite. And it will lead to the poor getting poorer and the rich getting richer. I yearn not and the people naturally becomes serene. Development comes naturally and intervention will prevent prosperity. Greediness will stimulate more demands and desires and make people become materialized. This is interesting as government can use this as a guideline for their performance. Lesser than this the people revile and curse him. PAP government should take a self test and evaluation in Chapter 17. How Singaporeans judge their performance may be reflected in the coming election. 2011upandcoming: 中文新解，早报新闻解读? 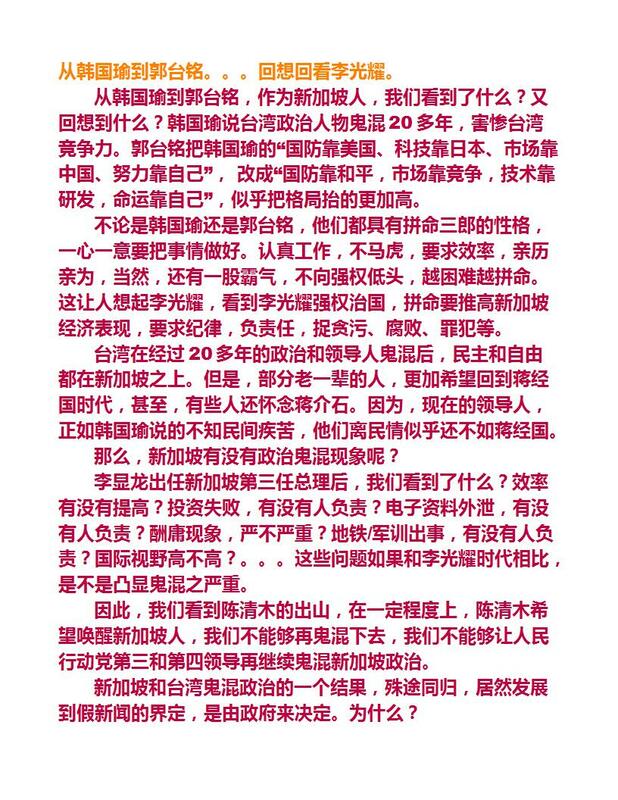 : "中文新解，早报新闻解读 这里选了十则早报新闻，解读一下其新意： 1休息是为了走更长的（总统）路？ 从政约30年的国务资政贾古玛教授和国会议长阿都拉决定为人民行动党政府自我更新而让路给新血，昨晚宣布双双引退，不参加来临的大选。 2 有其父必有其子，不知此子虎子否？早在1980年，当..."
2011upandcoming: 禁飞区来到新加坡，只许州官放火， 不许百姓点灯？: "生活的压力与生命的尊严那一个重要 只许行动党在集选区放火，而不许反对党在集选区点灯。副总理兼国家安全统筹部长黄根成对反对党要在来临的大选中攻克一个集选区的反应是否太过激烈了点。 政治本来就是要胜选，有哪一个政党会要求本身的候选人，不要去争取胜利。黄根成这一问，不是自打嘴巴吗..."
2011upandcoming: 职总和行动党：共生关系, 还是附庸，附属关系: "职总和行动党：共生关系, 还是附庸，附属关系 新加坡可能是世界上除了共产国家以外，高调大谈一个工会和一个政党发生共生关系。事实上，行动党不只是和工会发生共生关系，它也和公共服务部门发生共生关系。给人的感觉是三位一体。或者，露骨的说，一夫二妻。行动党有两宫，东宫是职总，西宫是政..."
2011upandcoming: 第四代领导人, 谁说了才算有效: "第四代领导人, 谁说了才算有效？笨蛋， 当然是选民。 这点，行动党也认可。张志贤说，行动党将在来临大选派出一支具有新活力、新想法的第四代领导人核心队伍让选民选择。这其中还很可能出现我国第四位总理人选。 这些话，从表面上看，没有问题。 深一层想一想，却令人疑惑，困扰和不解。 1...."
2011upandcoming: 有人出世就好命　反对党却要用命来打拚: "有人出世就好命　反对党却要用命来打拚 反对党要用命来打拚才会胜出 有人出世就好命，行动党候选人终于含金戴玉在媒体千万宠爱在一身的风光下出场了。贾宝玉不也是含着宝玉出世，最后，贾家不也落了个树倒猢狲散吗？ 反观在野党，新加坡媒体是报尤不报喜。反对党不管怎么努力，媒体还是用另类..."
2011upandcoming: 国之命，在人心，新移民也该投反对党: "国之命，在人心，新移民也该投反对党 新公民和旧公民都在同一条桥上 还记得小时候的一个孝道故事吗？孩子在做一个木碗，孩子的爸爸妈妈问，这是做给谁的啊？孩子回答说，这是做给爸爸妈妈的。爸爸妈妈问为什么？孩子说，他看到爸爸妈妈买了木碗给爷爷，因为，爷爷常常打破碗，所以，他现在也做..."
2011upandcoming: Confucianism “stands corrected” in Singapore: "Confucianism “stands corrected” in Singapore Many posts in the internet seem to misunderstand Confucianism, especially the type of Confucia..."
2011upandcoming: 己所不欲，忽施于人，我们和行动党都做到了吗？: "[决战集选区5] 己所不欲，忽施于人，我们和行动党都做到了吗？ 答案是我们和行动党都没有做到。那么，就从我们开始做起吧！ 新加坡选民的思维是，希望有反对党来制衡行动党。但是，最好的安排是这个反对党议员出现在其他的选区，不是在我的选区。主要原因是，担心反对党议员写的信在政府部门里..."
2011upandcoming: 让反对党赢得集选区，激励治国经商新思维: "[决战集选区4] 让反对党赢得集选区，激励治国经商新思维 反对党管理的集选区垃圾不会推到几层楼高 新加坡选民应该让反对党赢得几个集选区，因为这股震动力量将能为新加坡打开一个新局面。尤其是激励治国经商的新思维。反对党一定会尽全力把集选区办得更好，而行动党为收复失地，会更加..."
2011upandcoming: 部长也是普通人，是可以被替代的. Ministers are ordinary people and...: "[决战集选区3] 部长也是普通人，是可以被替代的， 您同意吗？ 价廉物美的部长哪里去了source: nhb.gov.sg 自从集选区人数从三人增加到五，六人后，领军人物一定是一，两位甚至三位部长。因此，行动党的口号是我们的部长是人中之龙，是最好的人才，因此，是不可被替..."
2011upandcoming: 下下次大选，还有阿裕尼吗？: "[决战集选区2] 下下次大选，还有阿裕尼吗？ 光明来到了 选区划分的结果大家都心知肚明，但是，媒体还是要说改变不大，公平竞争，新选区划分，对反对党更有利,因为集选区人数缩小了，单选区多了等等，实似而非的怪论。 我们以阿裕尼作为一个例子加以说明。阿裕尼集选区在2006 年..."
2011upandcoming: 不要再让友诺士的遗憾出现: "[决战集选区1] 不要再让友诺士的遗憾出现 勇往向前 36500 对35221。 50.89% 对49.11%。 这是新加坡历史上，票数最接近的一次集选区选举。 20 年过后，没有一次集选区的竞选比这次友诺士集选区选举更精彩，更令人遗憾。 不要让友诺士的遗憾再出现了。如..."
2011upandcoming: Dr. Lily Neo is more Confucius than PAP: "Dr. Lily Neo is more Confucius than PAP Judging from the recent parliament Budget debate and previous debates in parliament, it looks like D..."
2011upandcoming: 以子路精神，面对选战: "以子路精神，面对选战。不怕抹黑，勇敢应战。 这是新加坡反对党人要具备的精神。因为，他们面对的是穿着华丽，头顶着高帽，又有媒体护身的行动党人。面对着尊贵的对手，没有信心的反对党人，在声势上，在“身世出生”上，都会自觉慚愧。 因此，在此愿以论语子罕篇共勉之。 Zilu so..."
2011upandcoming: 反对党的真，行动党的。。。。: "反对党的真，行动党的。。。。 在新加坡的传媒，报纸，电视，经常都可以看到反对党的真情表演，但是，这种真情表演，却被负面化了。例如： 国民团结党抢先插旗卡位 2011选前报道 上电视辩论？反对党很盼望 执政党不赞成 一名政党领袖：工人党掉入“非选区议员圈套” 选区协商未有结果 ..."
2011upandcoming: 电梯坏了， 机会来了: "电梯坏了， 机会来了 Source: ST Photo 菲律宾总统阿奎诺II 昨天参观樟宜水源回收厂时，出了一个小状况。这位嘉宾被逼从地下60米，爬着楼梯一步一步走上来。 怪只怪我们的水源回收厂的电梯，不给面子。好不坏，偏偏选择有VIP来访时才坏。 现在，不能说50年才来..."
2011upandcoming: 果条来了，问题一样， 您吃吗？: "果条来了，问题一样， 您吃吗？ 人民行动党在阿裕尼集选区的竞选策略是一盘果条。事实上，整个新加坡的情形都是差不多的。在全国各地，行动党端出来也是一盘一盘的果条。只是文宣名目不一样而已。阿裕尼选民所面对的问题，也反映了新加坡的人民的问题。 因此，全国选民有必要认清这盘果条的内..."
2011upandcoming: 谁是头家: "谁是头家，人民还是议员或政府 3月6日早报的一则标题是“拉丁马士邻里“换头家”，内容是由于新的选区划分，拉丁马士将成为单选区，因此，新的负责议员将是陈振泉。 早报还引顾蔡矶的话，“你好。这一区已经不是丹戎巴葛了，换成拉丁马士。这位陈振泉是这里的新‘头家’（负责人），大选的时候要请..."
2011upandcoming: 政治上的墨家: "政治上的墨家Political Mohism in Singapore? Contrary to WP’s strategy of “wu wei”, Singapore Democratic Party (SDP) or Barisan Sosialis (BS) in the..."
2011upandcoming: 政治上的道家: "政治上的道家Political Daoism in Singapore? If you only rely on the web and internet on Singapore political development, quite obviously Workers’ P..."
2011upandcoming: “不奴隶，毋宁死” - 反思淡马锡模式: "www.geraldgiam.sg “不奴隶，毋宁死” - 反思淡马锡模式 中国前文化部长及作家王蒙在评论《红楼梦》时，看到了一个不正常现象 -“不奴隶，毋宁死”。 他还为此特意写了一本同名的书。 他说：《红楼梦》里的许多奴隶，尤其是、特别是有头有脸的女奴，都视不再当得成贾府..."
2011upandcoming: 认错的勇气: "http://geraldgiam.sg 认错的勇气 认错是需要很大的勇气的。尤其是在新加坡。建国以来，由于在经济上取得良好的表现，因此，即使有大的错误，那也是中低下官员的错。我们的政府领袖为国家创造了这么多就业机会，国库，外汇增加了这么多，因此，即使有些错误，好像，逃马..."
2011upandcoming: 自我感觉真好: "自我感觉真好 行动党似乎陶醉在2010年的高经济增长中，人人自我感觉真好，正如早报新闻标题打出来的一样：· 国会侧记 聆听财长教授般的演讲· &n..."
2011upandcoming: 反对之路不好走: "反对之路不好走 (Singapore opposition leaders Source: ST Photo) 在新加坡，反对之路不好走，人人都知道。但是，为何，明明知道山有虎，却偏偏要向虎山行呢？ 有人问高龄75的波东巴西区议员詹时中，为何还要出来竞选，该退休了，这么辛苦做什..."
2011upandcoming: 天才与白痴: "天才与白痴 调低消费税， 受惠者将是富人。 何来此说，这是不是新的经济理论. 我国三所大学都有经济系，专家学者们，可以不可以给国人做出一个合理的解释。 事缘国会辩论财政预算案，执政党和反对党提出不同的看法。市井小民一头雾水，不想做天才，更不想做白痴。 事缘，国防部政务部..."
2011upandcoming: 新加坡三大辣椒螃蟹连锁店: "新加坡三大辣椒螃蟹连锁店 (Source: ladyironchef.com) 新加坡三大政治辣椒螃蟹连锁店经已新鲜出炉了。不说您不知，一提您一定知。三者何也， 一为李总理， 二为李资政， 三为吴资政。 他们是如何把辣椒螃蟹连锁店开遍全国的？原来是通过集选区制度，把辣椒螃蟹连..."
2011upandcoming: 爱拼才会赢: "爱拼才会赢 (Source: Youtube) 欣闻工人党已把《爱拼才会赢》作为2011大选的非正式竞选主题歌。 是的。在此时此刻，反对党一定要比执政党更用功，更努力，更拼搏，才可能会拼出头，才可能会有否极泰来。 在形势逼人，支援短缺，资源贫乏的不利情形下，只有一路..."